You know Dynapac Rotating Company for our durable and reliable rotators and winches, but did you know that Dynapac also designs and produces custom parts? If you have a custom part you need made we have the services to build it! Dynapac offers a full range of services; consulting, design prototyping, and machine shop services. We can even 3D print! Our bold service makes it easy for you to get the custom parts you need. Dynapac’s shop features a wide range of different machines with different capabilities to produce almost any part you can think of. We have recently added a new machine to expand our repertoire; the Okuma LB3000 EX II machining center! This is a larger, more accurate machining center that both mills and turns parts, allowing us here at Dynapac to offer a wider range of services than ever before. With our specialization in producing our own gears and gearboxes the LB3000 is helping us to refine our craft even further with high precision gears and splines. With our wide range of capabilities, world-class service, and commitment to customer care Dynapac is ready to help you produce the parts you need to run your business smoothly. Contact Dynapac Rotating Company today to begin! Dynapac’s company slogan and creative commitment, “You dream it, we rotate it,” was on full display during a recent project commissioned by Sign Producers and Universal Studios. Having worked with companies like Disney and Universal Studios in the past, including a project at The Wizarding World of Harry Potter, Dynapac Rotating is well known in the industry for its ability to create custom-crafted devices, no matter the complexity or scope of the project. Based on this reputation, Sign Producers and Universal Studios reached out to Dynapac earlier this year to produce a special mechanical rotator device for the Toothsome Chocolate Emporium & Savory Feast Kitchen. Because the sign’s design called for a double mechanical rotator drive that could spin an outer ring while also rotating a minute hand back and forth, Dynapac set out to create a custom rotator unit with a custom frame and housing. Dynapac engineers designed a single unit with two bearings and two drive units to create the desired motion. The frame of the Dynapac rotator not only moves both objects (the rotating ring and the minute hand), but also holds the center stationary face of the sign. To achieve this, Dynapac engineers had to design a multi-concentric-tube device to hold all three objects – the moving minute hand, the stationary sign face, and the moving outer ring. And, as with every Dynapac drive unit, a safety clutch device was incorporated into both rotating elements to prevent damage to the gears, motor and sign due to high winds or obstruction from a foreign object. In addition to the mechanical parts, Dynapac designed and programmed a custom motor control system to operate the rotating ring and minute hand. A variable speed drive was added to provide the option to change the speed of the outer ring, and to reverse its direction. The sign’s minute hand waves back and forth using proximity sensors connected to the computer system. Once the hand hits the end of the stroke, the motor ramps down in speed and reverses direction gently, so as not to bounce and create a distraction to those viewing it. After a few design iterations to get the right fit and motion, Dynapac delivered a final product, which is now on display at Toothsome Chocolate Emporium & Savory Feast Kitchen at Universal Studios. At first glance, the casual observer might not appreciate the ingenuity of the design and the complexity of the motion involved, but perhaps that’s the mark of a well-made rotating sign. Universal Studios and Sign Producers dreamed it. Dynapac created it. If your business is looking to implement an attention-grabbing display like the one seen at Toothsome Chocolate Emporium & Savory Feast Kitchen, Dynapac Rotating Co. is ready to transform your dream into a rotating reality. Motion Attracts Attention! And, the more attention you can draw to your display, the more likely it will be that consumers respond to and remember your message. So, how does motion attract attention? Well, we know that movement in a person’s peripheral vision can trigger a shift in visual attention. How fast that attention shifts toward a moving object depends on the how animated the viewer perceives the object to be. Factors such as the speed of the object, the magnitude of its shift in position, and most importantly, whether this motion appears to be self-propelled or not all influence how much attention your display will receive. At Dynapac, we understand what it takes to produce attention-grabbing displays. 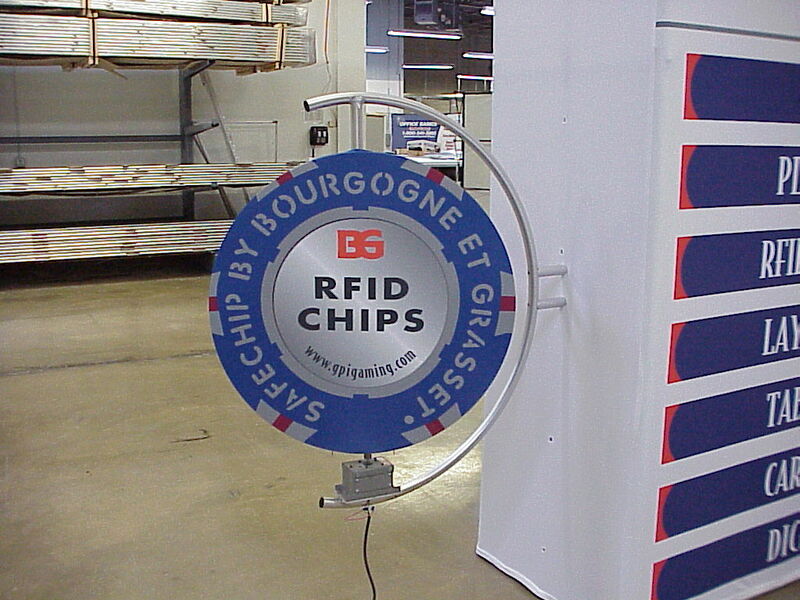 We are the industry leader in the design and manufacture of high quality motion products for the sign industry. But, our displays don’t just attract attention, they attract the type of attention you need to propel your message or brand forward. A static sign just does not have the same effect as a sign in motion. 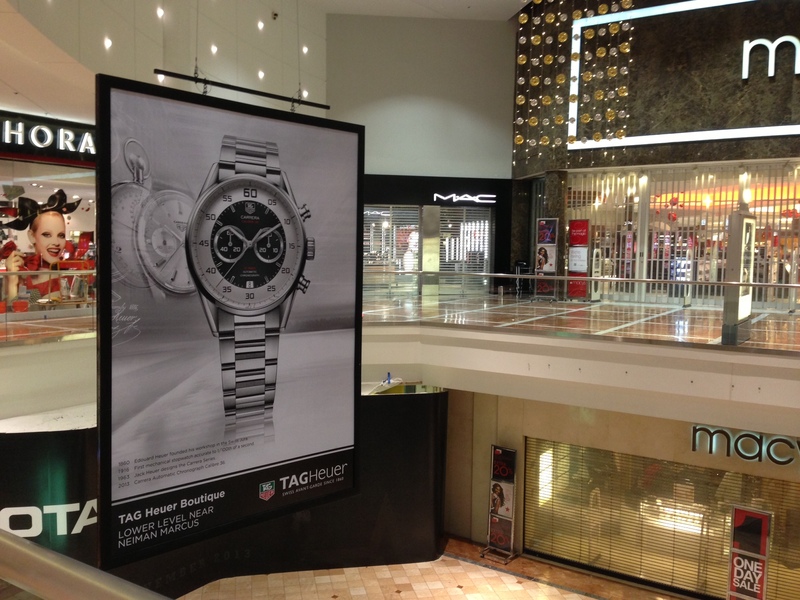 Anything that you can do to give your display or signage a unique spin, will morel likely capture the consumers attention and increase the likelihood that they will actually remember your message. According to a study by Ketchum Global Research and Analytics 76% of consumers said they have entered a store they have never visited before based on its signs. Also 68% of consumers said they have purchased a product or service because a sign caught their eye. Let motion help you stand out and catch the eye of your consumers. The quality of your signage may have more of an effect than you think. According to that same study by Ketchum Global Research and Analytics, 68 percent of customers believe that a store’s sign reflects the quality of its products and services. In other words, customers believe that a company with a badly designed or unattractive sign will offer an inferior product or unprofessional service. Additionally, 52 percent of people interviewed in the survey state that they’re less willing to shop at a store with a poorly made sign. Let our high quality rotators and animation mechanisms help speak for the high quality products and services you offer. Have you ever wondered what allows Dynapac Rotators to rotate without wires getting twisted or tangled? The answer is collector rings! What is a collector ring? A collector ring is a small, cylindrical device with several metal rings, called ‘slip rings’, at regular intervals along its length. These slip rings are just as conductive as standard copper wire, but don’t have any parts that can twist or tangle. When the rotator unit is powered on the unit remains stationary while the collector ring rotates alongside the turntable and provides power to the rotating display. At Dynapac there are two varieties of collector ring; standard power and video signal. Standard power collector rings are used to transfer electricity to a standard rotating outlet, which then can be used to power lights, speakers and movement. Video signal collector rings transfer high quality video signal to rotating screens. At this time Dynapac is pleased to announced our newly remodeled, barrel style standard collector rings, which are in all Dyanapc rotators as of July 1, 2016. New barrel style collector rings come standard with up to 12 power wires, each wire rated to 15 or 30 amps each and collector rings with higher amperage or more wires can be built if needed. This is a 33% power increase over our old 9 ring standard collector rings. Dynapac is able to provide this increase in power by decreasing the size of the ring itself, fitting more rings into the same space. As well as being more compact, our new standard power collector rings are more heavily insulated; this provides more protection for anyone working on or around the rotator and protects the collector ring itself from debris. Video signal collector rings use a very high quality slip ring system to transfer video signal and data. Our standard video signal collector rings can transfer data over CAT5 Ethernet at a rate of 100 Megabit per second or 1 Gigabit per second, depending on the unit. Dynapac is also able to build custom video signal collector rings when called for, up to 4k video passthrough! All around the globe people are coming up with new and creative ways to use motion to make their company and their products stand out. Here are four of the most unusual, most unique and all around most fun uses for Dynapac Rotators we have seen. 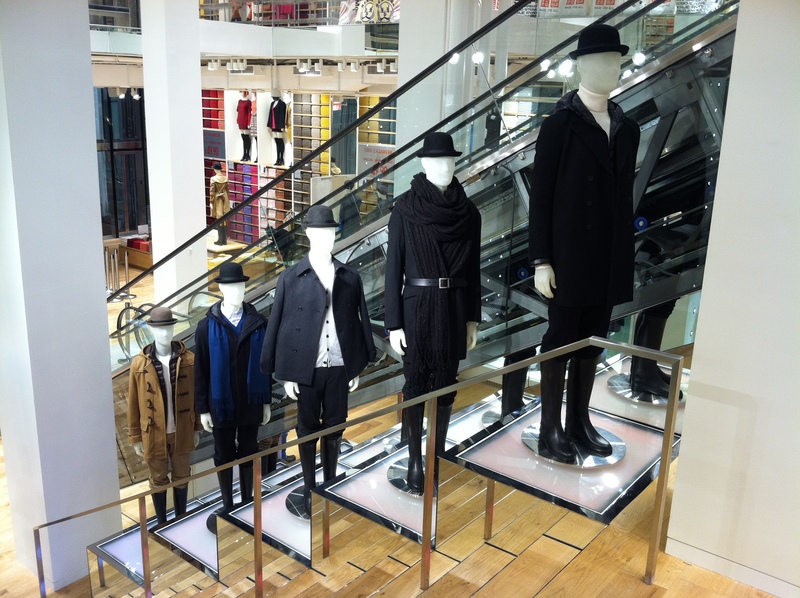 The most fashionable item on our list, this lively crowd is on display for the Japan-based clothing company Uniqlo. The mannequins are placed throughout the store, in the front windows and even hanging upside down from the ceiling and every mannequin in the store rotates in perfect synchronization. 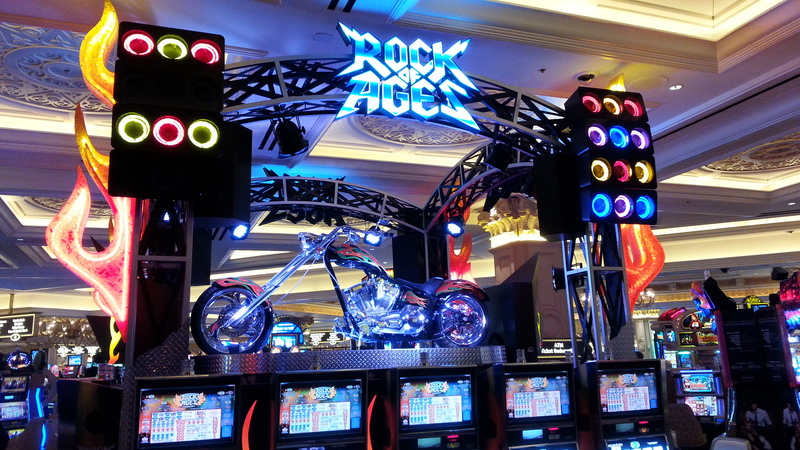 Instead of constantly turning, the Rock of Ages Slot Display at the Venetian in Las Vegas makes half a turn before pausing. 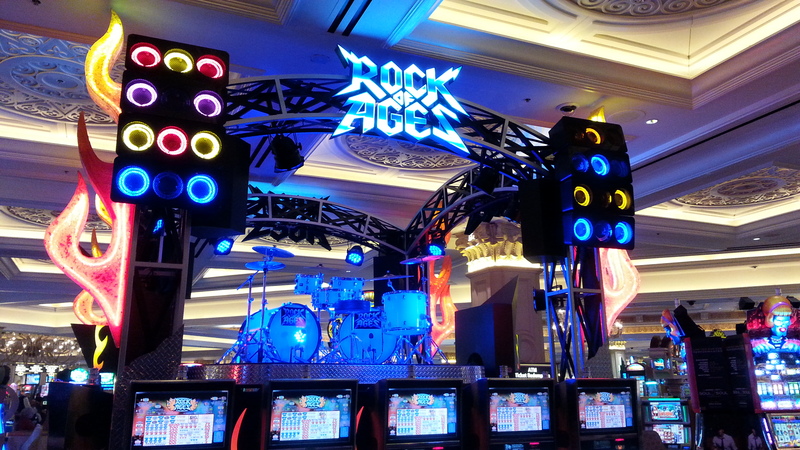 This gives casino-goers plenty of time to admire the flipping stage and its reversible display; a motorcycle on one side and a drum kit on the other. Whichever side isn’t on facing upwards is cleverly hidden below the stage while it waits for its turn in the spotlight. What better way to celebrate the Indianapolis-500 than with a party, complete with hanging Indy Car in the place of a disco ball? BMG Event Productions suspended the several thousand pound car, upside-down, from the ceiling above the dance floor for the event. Like any good car turned disco ball the display rotates slowly to reflect the lights. For New Years 2015 and 2016 Salt Lake City has forgone fireworks in favor of a giant disco ball, the largest in the United States, built by artist Derek Dyer and christened the MirrorBall. The behemoth, measuring over 60 feet in diameter, is opened up and rotated at ground level, allowing party-goers to walk inside before it is hoisted over the city on December 31. And the spinning disco ball is, of course, dropped when the clock strikes 12. We’ve all seen them; spinning signs, rotating cars, and flashy hanging disco balls at parties. But did you know that behind these eye catching displays are a variety of styles of rotators? Originally used for large-scale signage outside businesses, these powerful machines are still turning heads in theme parks, stadiums, the Las Vegas strip and internationally. Built to withstand wind and weather they’re proof that the classics never die. The Indoor Rotator is an incredibly versatile tool, used to draw attention to everything from airport information to mannequins to coffee shop logos. They’re a popular choice to advertise specific brands in bars and pubs, strong enough to rotate a car and have even been used to display products on the home shopping network. As their name suggests Banner Winch Rotators’ talents lie in their ability to raise and lower signs in addition to turning them. The banner winch inside the rotator safely lowers the sign for repairs or changes. Convenience is key and the Banner Winch is ideal for lightweight, seasonal signs that need to be changed out quickly and easily. 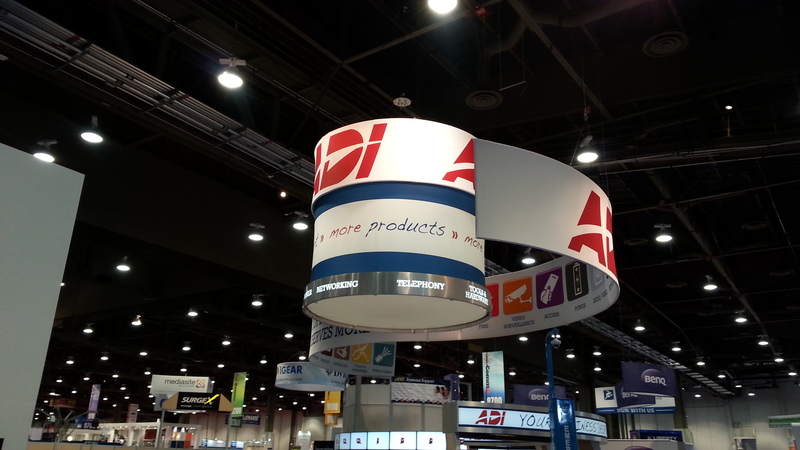 Made for use with stretch fabric banners and light displays, Hanging Rotators themselves are light and inexpensive. But don’t let that fool you; they’re no lightweights when it comes to attracting attention. The turning motion of a Hanging Rotator is sure to draw eyes when placed against the stationary backdrop of a trade show or retail environment. These rotators are built to attract the attention of foot traffic in a trade show booth. Turning signs, displays and even TV’s catch the eye of anyone walking past because they stand out among the hundreds of stationary signs around them. Even bad real estate isn’t a problem; booths at the back and sides of the hall get lots of visitors thanks to rotating signs drawing people in. Video Rotators come in two styles; Casino LCD and Classic LED. 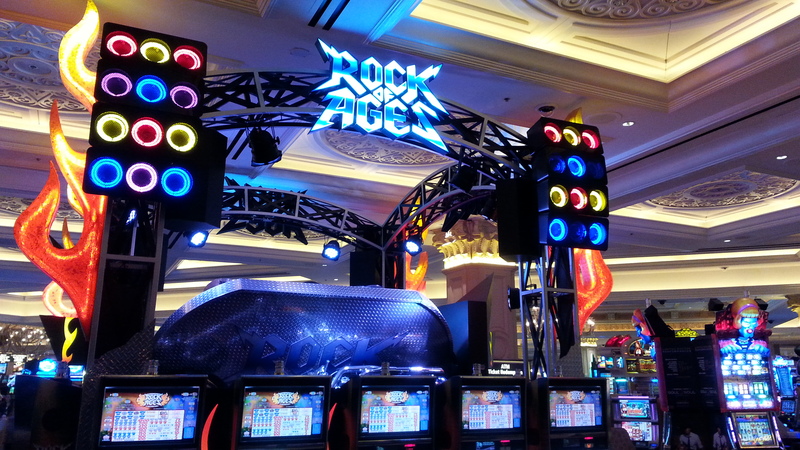 Casino LCD’s are large, flashy and always in motion above slot machines and other casino games. When it comes to drawing attention casino style Video Rotators are the kings. On the other end of the spectrum Classic LED Video Rotators move so slowly that you’ll barely notice. Quiet and subtle, they’re used in shopping centers to give 360 degree video viewing without ever completely obstructing the customers line of sight to any store in the mall. The littlest member of the rotator family, Display Turntables typically carry small objects and light loads, though they can handle up to 800 lbs if needed. 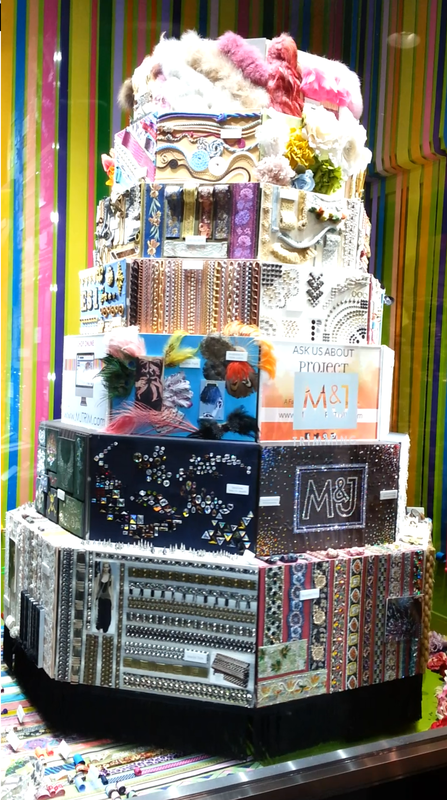 They’re used in shopfronts and store windows to show point of purchase items like shoes, baked goods and jewelry, increasing interest and sales in those products along the way. From point-of-purchase to large scale product displays, the competition for consumer awareness is never ending. At Dynapac we have made it our business for over 50 years to attract attention and engage consumer awareness with high quality motion products that stand out among static displays and stationary signage. With the capacity to custom engineer both indoor and outdoor rotating product displays, and experience with exhibits ranging from 20 to 100,000 pounds, Dynapac has become the industry leader in rotation and special applications for the sign industry. Motion has proved to be one of the most invaluable ways to attract attention in the advertising industry. The difference between an advertisement that sells itself over and over and one that does not is simple: consumer awareness. In order to create a “view” that will stand out and remain with the consumer, a product needs to be advertised in a creative way. This becomes simple with a Dynapac rotator or rotating product display, as product perception increases by over 50% with a motion display as compared to a static one (POPAI). Research conducted for Point-of-Purchase Advertising Institute (POPAI) looked into the effectiveness of both motion and static displays, noting results in Market Sales as well as Consumer Awareness. Their studies showed that motion does indeed attract attention, increasing sales by 107% in product specific stores with a rotating product display in comparison with a 56% sales increase in the same stores that carried static displays. In a Consumer Awareness Test, based on three different point-of-purchase product displays, POPAI discovered that 94% of consumers recalled seeing the display with rotating motion, 62% recalled the display with front to back motion and only 43% recalled seeing the static display for the same product. Their conclusion? “The value of traditional point-of-purchase displays can be increased by the use of attention getting devices such as motion.” Motion stands out. Dynapac knows that there are significant advantages to using motion to engage consumers and make interesting, memorable point-of-purchase displays that can lead to improved sales, market share and consumer brand awareness (POPAI). POPAI. Two Studies on the Effectiveness of Static and Motion Displays, conducted by Product Acceptance and Research, Inc. for the Point-of-Purchase Advertising Institute, Inc. (POPAI) Information Center. Dynapac’s Display Turntables present any product with ingenuity and flair, and are made for standard loads up to 100,000 lbs. or built to spec for any occasion, from car shows to point of purchase displays such as watches or jewelry. Dynapac Display Turntables may be controlled remotely as well as made to rotate in sync for display purposes. Dynapac Display Turntables come with or without rotating wires, and small models have the option to run on D-cell batteries or plug into the wall. Weighing 1500 lbs each, and with barely over a millimeter of separation between them, giant LED screen covered doors with Dynapac custom motorized hinges are poised to open for happy couples in a Singapore wedding chapel sometime in the first half of 2015. These awe inspiring doors are outfitted in a wall of LED that towers at about 10 meters (32 ft) and span 16 meters (52 ft) across the chapel, where lucky wedding guests will be able to view pictures and videos of the couple as they walk through the doors, each about 6×6 meters. The doors open inward about ninety degrees from a fitted position adjustable to within 1.5 mm of space between the doors, and are equipped with a safety system also engineered by Dynapac that stops the doors before they could potentially harm someone with their crushing force.